"That you may become blameless and harmless, children of God without fault in the midst of a crooked and perverse generation, among whom you shine as lights in the world, holding fast the word of life..."
"Casting down arguments and every high thing that exalts itself against the knowledge of God, bringing every thought into captivity to the obedience of Christ." When I was younger, I remember reading a book of poetry on the different months. I like to tease my sister with the description of her birthday month of November (as if anyone can determine the month they are born in anyway). It went something like this: November is a cold, dull and dreary month…that’s all I needed, especially when my birthday month of June was something to the effect of a cheerful and warm month… Despite being dull and dreary, November offers us two holidays to reflect on what we have been given-Veteran’s Day, and Thanksgiving. While thinking about Thanksgiving and being thankful, I offer my following thoughts on the subject. Everything we have is from God, period. “Every good gift and every perfect gift is from above, and comes down from the Father of lights, with whom there is no variation or shadow of turning.” James 1:17 (you may want to look at Eccl 2:24-25, and 2 Cor 9:10-15 ). Recognizing this (that everything we have is from God) leads to thankfulness and consequently the right perspective in life. You see, when we are thankful we realize that what we have is from God alone. When we realize that what we have is from God alone, this leads us to not become possessive of, or always striving after material things. In other words, being thankful helps us to set our mind on things above (see Col. 3:2) as well as helps us be in the world, but not of the world. In a way then, thankfulness is kind of like a belief, in that it affects the way we live our life. In the same way that the beliefs that make up our worldview affect the way we live and respond to things that happen around us, so does thankfulness affect the way we view our belongings and all the other things (whether material or circumstantial) God has given to us. Consider for a moment the story about the ten lepers. Could it be that the one leper truly realized that his healing was a gift from God? This caused thanksgiving in his heart, and it changed the way he responded, or lived life. He turned around and thanked Jesus for what he had done in his life, unlike the other nine. We as Christians have the supreme reason to be thankful this Thanksgiving. We have the gift of salvation through Christ, given to us by God. Thanks be to God for His indescribable gift! What has God blessed you with? I was there at Gettysburg on that tragic, tragic day When brother fought against brother -the Blue against the Gray. I went to France with A.E.F. to bring the peace to you. I'm still here at Pearl Harbor since that December seventh day of infamy. Lying silently with shipmates on the U.S. S. Arizona at the bottom of the sea. D-Day June 6th 1944, we hit the beaches of Normandy and we fought up hill every inch of the way. We routed the Germans and hurled them back but what a terrible price we had to pay. In Korea I heard the C.O. shout "we'll make it - I'm sure we will"I lost my life to try and take a spot called Pork Chop Hill. I'm one of sixty thousand who never will return. I was killed in a Scud attack in a war called--Desert Storm! -- I pray she remembers me. 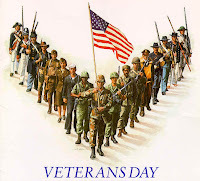 To all veterans: Thank you! Thank you for your selfless sacrifice on behalf of me and our country. God bless you! Thank you Lord for people like my brother Brian, and both of my grandpas, who served our country so faithfully! We are saddened today for two reasons. First, that our country has elected a godless man for her next president. Second, that we, through this blog, did not do enough to convince most of our Christian readers that sticking to our values in an election is more important than winning, and that fearing God is more important than fearing a socialist. Our intention with this final Election 2008 article isn’t to “beat a dead horse” or to judge you, our readers, but our focus is on future elections and the role Christians play in them. What comes across in these comments is that the focus was on doing everything possible to prohibit Obama from gaining the presidency (which is pragmatism), because it seems your greatest fear would be for him to hold that office. In this election, the greatest mistake that was made was that Christians did not heed the principles given to us by God. God has given us values through His Word. We did not fear Him, because we sacrificed those values, to vote for someone who contradicted them. We did not honor God because we put Christian support behind someone who didn’t support the values we hold. Another response we got was that Scripture doesn’t bar voting the lesser of two evils. Once again, the Bible gives us principles, values, and standards by which to live. These standards must permeate every aspect of our lives, including choosing and disqualifying any candidate who doesn’t represent those standards. Just because we live in a secular society, doesn’t mean we should compartmentalize our beliefs. Rather, we must adhere to them when it is unpopular and even dangerous. (Matthew 5:13-16) How will we ever truly influence the secular realm of politics if we never take a stand by voting for our Christian beliefs? A major issue Christians used in justifying their vote, was that it would save the lives of thousands of unborn children. Indeed, this should be a very big issue for Christians, because God hates the shedding of innocent blood. However, it is clear that neither of the two major candidates were pro-life. Is it any wonder that people didn’t feel good about voting for either one of them? So our question is, why would you vote for anybody who kills the innocent, under any circumstance? Is this putting our support behind a candidate who God looks upon with favor? Are we putting ourselves into a position where God can bless us, when we support a candidate who supports the killing of the unborn? The general response to this was that many more lives would be killed under an Obama presidency, or that McCain wasn’t as bad. Now, humor us for a moment. Imagine that Barack Obama is running against Adolph Hitler. Suddenly, Obama is the “more pro-life candidate”. Do we as Christians now put our support and influence behind the lesser of the two killing-candidates? No, of course not! In the same way, why would we put our support behind a flip-flopping, "semi-life" candidate, when our God-given beliefs and values tell us otherwise? You can’t be part way pro-life - you either are, or you aren’t. We said that the third party candidate most likely wouldn’t win. But at the same time, one would have to have been quite unrealistic to think that John McCain had a chance of winning, especially here in Minnesota. So, if winning is our criterion, why didn’t we all vote for Obama? As Christians, we don’t vote for the person with best chance of winning, we vote for the candidate who best represents the values and beliefs that we hold. Above all, God commands us to be faithful. Consider the story of Daniel. He was faithful and obedient to God, no matter the cost, and as a result God blessed him, even in a pagan land. Elections are a test to see wherein our faith lies. Is it in God, or a candidate? “He who is faithful in what is least is faithful also in much; and he who is unjust in what is least is unjust also in much.” - Luke 16:10 As Christians, winning is not the “end-all”, being faithful to God’s commands is. One way we honor God is by keeping the convictions He has given us. If these convictions aren’t worth losing for, then they’re not worth having at all. 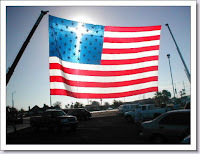 So, come next election time, when it again will seem like it is the most crucial election yet, we would urge all of our readers to make their highest priority that of honoring God, no matter what – our country can’t afford to have us not to. The intended purpose of this blog is first and foremost to glorify Christ in our writings. The second purpose is to provide a humble opinion of current events as we see them through the lens of our Christian worldview. Interaction from you will definitely be appreciated as it makes the discussion topics much more interesting. We welcome any questions, comments, and disagreements you may have, so that not only may we spur you on in your walk with Christ, but that you may also spur us on in our relationship with Him. "...Do not be children in your thinking; yet in evil be infants, but in your thinking be mature."